Tired of tracking dirt into your clean home? Call the experts at Kwekel Services, LLC and get the epoxy floor coating you've been hoping for. Finally, you've decided to tackle that garage floor. The trash has been removed, the tools are hanging neatly on the wall. Bikes and toys are in their place. You're ready to take that final step and remove the dirt and oil stains from your garage floor and give it an epoxy coating. It's time for a shiny, clean garage floor that your car will love to come home to. Whether you are looking for a clean, easy to maintain garage floor to serve as an attractive entrance to your home, or want to turn your garage into a play room or man cave, applying garage epoxy will give you the perfect finish. Our color and style offerings run the gamut from basic grey floor coatings to highly polished flecked epoxy. Whatever you choose, when you have Kwekel Services, LLC apply epoxy to your garage floor, you'll be getting a top quality epoxy coating product and a crew with the expertise to apply it properly. In order for a new epoxy floor to bond properly to the concrete surface, proper care must be given to prepare the surface. First, the garage floor will be thoroughly cleaned. We'll scrub away any spots and stains as well as remove all loose particles. Next, cracks and holes will be patched and allowed to completely dry. If necessary, the concrete surface will be etched to allow a more secure bonding of the epoxy. Next comes the fun part. We'll work with you to determine the look and functionality that you're looking for in an epoxy. You might want a simple clean, gleaming floor, one with colorful flecks, or one that has the added safety feature of anti skid particles. There is also a wide variety of colors to choose from. We'll wait for a warm, dry day to apply a coat of primer and your epoxy paint; otherwise the paint may peel or chip prematurely. Drying must be built in after each step but it's worth the wait. When we allow 12-24 hours of drying time between steps, your floor will be tough and durable for many years to come. Finally, we'll clean up all of our equipment, painter's tape and drop cloths and leave your property just as we found it. 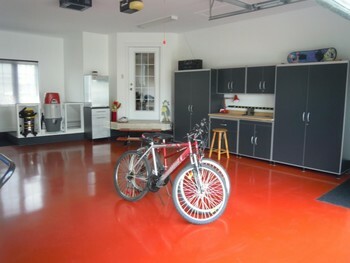 All we'll leave is a bright, clean garage floor.